Abstract: Tooth whitening to treat unaesthetic yellow/brown lesions has a strong evidence base and is a routine cosmetic procedure in many dental practices. 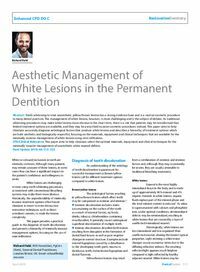 The management of white lesions, however, is more challenging and is the subject of debate. As traditional whitening procedures may make white lesions more obvious in the short term, there is a risk that patients may be misinformed that limited treatment options are available, and they may be prescribed invasive cosmetic procedures instead. This paper aims to help clinicians accurately diagnose aetiological factors that produce white lesions and describes a hierarchy of treatment options which are both aesthetic and biologically respectful, focusing on the materials, equipment and clinical techniques that are available for the minimally invasive management of white lesions using resin infiltration. Clinical relevance: This paper aims to help clinicians select the optimal materials, equipment and clinical techniques for the minimally invasive management of unaesthetic white enamel defects. Objective: To advise on the selection of optimal materials, equipment and clinical techniques for the minimally invasive management of white lesions using resin infiltration.